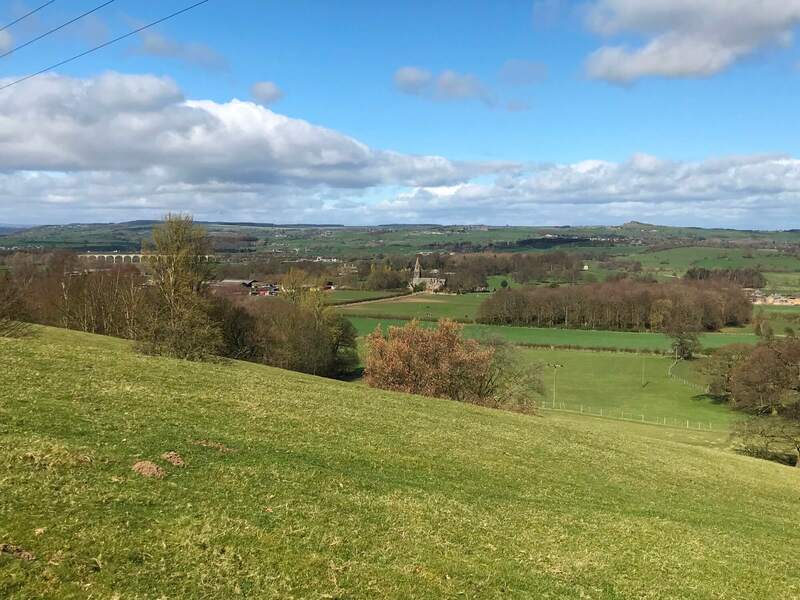 An interesting walk in lower Wharfedale from the upmarket hill top village of Bramhope down to the scattered community of Arthington with some fine views of the valley on the return via Bank Top. This was one of a few 5-6 mile routes I’ve had in mind for a family walk or solo summer evening walk. As we were planning a family walk I gave my wife Lisa a few options and she chose this one. I think one of the main points of interest for her was that it would be walking around the countryside she sees everyday on the train commute to Leeds. This was also of some interest to me and, whilst unfortunately the ornately designed northern entrance to Bramhope Tunnel is out of bounds, I wanted to get some views of the Wharfedale Viaduct. A secondary reason why I wanted to do this walk is that I’d had the trig point on The Bowshaws on my to-do list for quite sometime. The route, which I’d taken from Paul Hannon’s walking guide ‘Harrogate & Wharfe Valley’ passes close to the trig point. We started the walk from the centre of Bramhope, parking on the roadside just near the Methodist church on Eastgate. Walking back to the main crossroads I took a couple of pictures of the unusual cross and lantern. A plaque says this was presented to the village in 1937 by someone called W.B. Woodhouse, ESQ. Turning right down Church Street we carefully crossed the busy A660 to turn left. Passing a Puritan Chapel dating to 1649 we then turned right down Staircase Lane. At a footpath sign we turned right off the lane and on to a sloping pasture and the first of many fine views we would enjoy of lower Wharfedale. Descending past a small football pitch we also passed through one of a number of kissing gates – nice if you want a romantic walk! After a short enclosed section the path dropped down Broom Bank to pass between fences alongside the Harrogate to Leeds line. We were soon deflected away by an embankment that once carried a branch line to Otley. Like so many railway lines it was a victim of the Beeching cuts in the 1960’s. Passing underneath a bridge we then followed a track out the western end of the scattered community of Arthington. Just to our left was the Wharfedale Inn. Crossing the road we turned left to pass under the railway to begin a mile section on a footway alongside the road. Along the way we had some fine views of the Wharfedale Viaduct backed by the unmistakeable outline of Almscliff Crag. We also passed a number of converted houses whose names betrayed their original function, such as the Old Post Office and the Old School House. Eventually we left the road at a path heading south up the side of Arthington’s church. Dating to 1864 the church was originally dedicated to St Peter. Today it is that rather rare thing, a Coptic Orthodox church dedicated to St Mary & St Abanoub. Passing around the back of the church we then took a path up alongside some fields containing some horses. We then slanted up below some woods before a short steep pull up to the farm at Bank Side. Whilst Lisa and Rhiannon sat down in the shelter of a wall to have their picnic I left them for ten minutes to carry on uphill to visit The Bowshaws trig point. I found it sat in the shelter of a wall. Whilst the views were far reaching in truth the views of lower Wharfedale were better further back down the hill. Still I had finally bagged this particular trig point. After retracing my steps and eating my own lunch we climbed gently up Bank Top Lane enjoying more fantastic views of lower Wharfedale. Along the way we passed a small memorial to Colin Gamble of Bank Top Farm who died at a young age in 1970. Passing the buildings at Bank Top Farm we reached a road. Turning right we walked carefully down this until reaching a bridleway heading into the woods on the left. This passed along the northern edge of Arthington Quarry where they quarry sandstone. The bridleway soon brought us to a wider track which we followed down to Creskeld Lane. Turning right on this we then took another bridleway on the left. This initially passed along the edge of a wood before entering another one above a little stream. This path soon climbed up on to one of the very expensive looking suburbs of Bramhope. Crossing over a couple of streets we continued following the bridleway all the way back up to the A660. Just before reaching the road we came across the remains of a pump and well that were discovered in 1991. Crossing back over the A660 there was an interesting milestone below St Giles Church which had distances in miles and furlongs. From there it was a short walk back up to the cross and then left to where we’d parked the car.